The last Windows laptop I purchased was a Sony Vaio – it retailed for about $3000 but I got it on special. It hasn’t totally given up the ghost yet but it got to the point where it was getting slower and slower and surprising me with blue screens on a regular basis so I decided to buy a new laptop before I needed to. When I looked online to see what I could get for around $2500 I realised that I was looking at laptops with pretty much the same specs as my old one. And I wanted more. I also didn’t want to be stuck with Windows 8 which I thought was going to reduce my efficiency. I could use Windows 7 without any trouble but Windows 8 was a very different beast, and it was a beast I didn’t care to befriend. So I decided to look into what I could get from Apple in my price range. I already had an iPhone and iPad so I was comfortable with a move from Windows to iOS, particularly having used Apple Macs at work enough to be able to do the basics, i.e., find and open a file, edit, save and print. For $2500 I could get a 13″ MacBook Pro – a 15″ would be another $300. Or I could buy a 27″ iMac. I already had my iPad with wireless keyboard that I could use as a portable device and thought that I could probably get my Windows laptop to live a little longer if I downloaded a stack of files to my external drive and do a disc cleanup, defrag and check it for malware, etc. The iMac offered me far more computer for my money so that’s what I bought and I have never regretted it. I later managed to get a refurbished Macbook for a really good price – it’s an older model than available now but has good specs and I was able to upgrade the operating system to Mavericks. So I’m now running 2 Apple computers, both on the same operating system and I have my laptop waiting for me to give it some tender loving care one day. At work, I am the Digital Services Lead for Te Horowhenua Trust, working out of Te Takere. My job combines keeping the technology in shipshape working order, rolling out innovative and exciting projects and supporting members of the community in learning how to use digital technology. Many of my customers are 50+ and are using laptops, tablets and eReaders that were given to them by family members who said “Mum, you need an iPad” or suggested they upgrade their slow Windows 98 laptop to a Windows 8 one. Showing someone how to use their eReader or tablet is easy – I start by finding out what they want to use their device for (although with eReaders it goes without saying they want to read ebooks) and I teach them just enough to do those one or two things. If they can go home and confidently manage those few things they’ll hopefully have the confidence to explore a bit more on their own or return to learn more. The customers I find hardest to help are those with Windows 8 laptops and tablets – I hate Windows 8. I don’t know what Microsoft were thinking and hope that one day we’ll see a Windows 9 that once again considers usability. One of my upcoming work projects is running a Technology Petting Zoo. In order to do this, we needed to have access to some newer technology than then 2 year old iPad, Android tablets and eReaders than we had, so I went shopping. We now have a Windows 8 tablet (because even though I don’t like the interface I can see benefits in running a tablet that’s on the same platform as a PC and it won’t do me any harm to become a bit more proficient in it), the basic $99 Kindle eReader, the top of the range $279 Kobo Aura HD eReader and an Acer 11.6″ Chromebook that cost less than $400 on special. 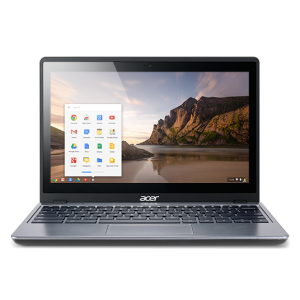 There were 4 models of Chromebook available and I simply chose the cheapest. the ease of setting it up. I selected a language and timezone, connected to my wireless internet and was up and running. usability – the Chrome operating system has limited settings which makes it so simple for someone with limited IT skills. They aren’t overwhelmed by buttons and menus and icons. size. It’s small, thin, lightweight but still feels like a good quality device. one account – I sign in with my Google account (or signup for one if I don’t have one) and I’m away, downloading apps from the app store to add extra functionality – I installed Twitter, Facebook, backgammon with just a few clicks. battery life. In the past I’ve had laptops that need to be plugged in every 3-4 hours. This machine offers 8.5 hours of battery life. That’s impressive for a very low priced computer. 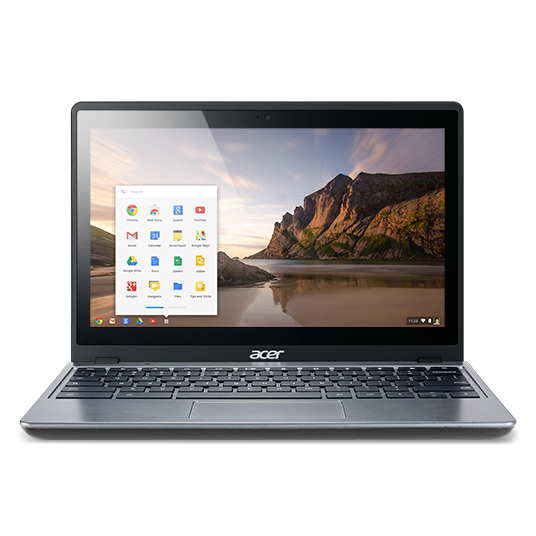 Many schools are turning to the Google Chromebook as a device for their students. They are half the price of the cheapest iPad and you can do so much more with them. This little machine (and other Chromebooks) will help bridge the digital divide more than any device I’ve come across – it’s significantly more affordable than a computer running Windows or iOS so more people will be able to gain computer skills than ever before. It’s not possible to overstate the benefits of people becoming digitally literate. People will be able to apply for more jobs, have access to better information (government and health information for example), parents will be able to learn alongside their children, and that’s just a few off the top of my head. Well done Google – I’m thoroughly impressed.